What Firebase Analytics, Deep Linking and Instant Apps tell us about where the mobile web heading. With all the recent announcements from Google I/O 2016 regarding the app universe, could Google be hinting on their intentions of the future of the mobile web? When Google announced deep linking in 2013, their mission was clear: to provide the user with more seamless experience, which meant ability to view search results in previously installed apps. They have expanded their deep linking efforts in 2015 when they announced app deep linking for iOS apps as well. One of the most exciting moments from Google’s annual I/O 2016 event last month was their announcement regarding Instant Apps. Android Instant Apps is a next step (or rather a leap) in the evolution of mobile apps, which allows users to load apps instantly (hence the name), without the need of installing them beforehand. This means, that we – users are able to get all the benefits of better UX and personalised features without the downsides of a slow loading mobile site or the necessity to manually find and install the app – and thus clutter our phone’s precious storage. As exciting as it is, this development comes hardly as a surprise – it’s really more of Google’s very logical next step in what could be a brilliant master plan to deep-link whole mobile web and thus effectively merge mobile websites and mobile apps into a new medium. With more searches being made from mobile devices than ever before, it’s quite obvious that the future of web is mobile. And as it seems, the future of the mobile web are the apps rather than mobile websites. With Android Instant Apps, the fact that user doesn’t need to have any app installed in order to open it, it really feels like the line between an app and a mobile website is non-existent. Android Instant Apps are split into several modules. This means that every time a user clicks on a deep link which opens certain screen in an app, their device only downloads as much of the code, as is necessary to run this particular screen in an app. The good news is that developers don’t need to build a new app from scratch. They can simply upgrade their existing app, which takes much less time and resources. Official documentation for Android Instant Apps is available only to selected developers so far, but if you are interested, you can ask for an early access here. As for the users, Android Instant Apps are compatible with Android version all the way to Jellybeans. Everyone who’s ever built and launched an app – Android or iOS – will agree with that it requires a lot of work and effort to get to the top positions in Google Play or App Store. Only a small percentage of apps are ever discovered or used by users. Android Instant Apps gives apps more discoverability – basically your app can benefit from your website’s existing rankings and possibly years of SEO efforts. Although users don’t have to download the app as a whole, consider it as a sampling – if users will love your app, maybe they will come back and install it in full. 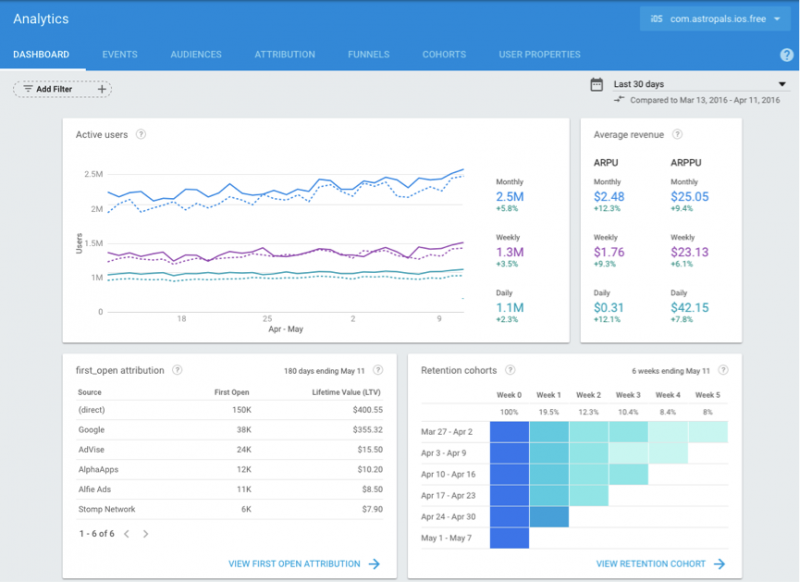 Another big app-related announcement from Google I/O was the new Firebase Analytics platform. Firebase was originally a tech startup founded by Andrew Lee and James Taplin. They built Firebase as a backend service that helps developers build realtime apps for iOS, Android and the web that can store and sync data instantly. Firebase was later acquired by Google in October 2014. This May, Google announced a new feature built on top of the Firebase platform: Firebase Analytics. The first question, which inevitable comes to mind is – why would Google bother building new analytics platform, when there is one perfectly good Google-owned analytics already? As opposed to Google Analytics for apps, Firebase Analytics was built primarily with apps in mind. This means that Firebase Analytics provides multiple key functions that are not available in Google Analytics for exactly that reason: tracking in GA is focused on page views and sessions or impressions. Firebase is by default providing you with user-based data. This is closely related to another new feature – audiences which allow developers to define groups of users with common attributes. You can find out more about what Firebase Analytics is bringing here. While Firebase Analytics is completely free, you might not want to get rid of your existing Google Analytics account just yet. Google’s recommendation for companies who run both website and an app is to use both Google Analytics and Firebase Analytics in parallel. In fact, you can even connect your Firebase to Google Analytics and see the Firebase Analytics reports within Google Analytics interface. Of course, at the moment it’s unclear how fast or slow the adoption of all new technologies by Google will be, but one thing is quite obvious: Google’s idea of the future of mobile web is strongly in favour of apps. In case of Instant Android Apps it almost looks like we are looking on a new medium: a hybrid of mobile websites and apps. Or maybe it’s just a new generation of apps? It’s about time Brand’s change the way they look at apps. Apps are no longer a one component to your digital marketing strategy and are slowing becoming the centre and deserve attention accordingly.